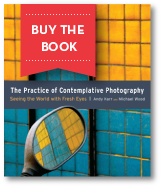 The Practice of Contemplative Photography offers a series of photographic assignments, along with examples of images that successfully fulfill them. The purpose of these assignments is to help you connect directly with the visual world and to express that experience photographically. On this site we briefly summarize these instructions. Without the extensive presentations in the book, you might find the assignments a bit cryptic, but please give them a try. Assignments provide specific intentions for you to work with. These intentions are like stop signs for thinking mind. When you glimpse what you intend to see, discursiveness is interrupted, leaving a gap for direct perception to shine through. These assignments have been developed for the purpose of training. They are not meant to suggest good subject matter for contemplative photography. They are just methods to help you align eye and mind. When eye and mind are aligned, any fresh, direct perception is good subject matter. Over 15,200 photos were submitted, reviewed, and published in the Seeing Fresh assignment galleries from 2011 through 2017. While the site is no longer accepting new photo submissions, we would like to thank all of the people who participated in the assignments on Seeing Fresh, and extend our deep appreciation to everyone who shared their fresh perceptions through this process. The assignment galleries have been organized to showcase some of the great photos that were submitted for each assignment, and that collectively offer a broad range of perceptions and examples for each one.